I don't know about you but I really love the 4th of July. Although, I really hate the fact that the children in my neighborhood feel the need to begin popping firecrackers on the 1st of July. Nevertheless, little annoyances aside, I love to eat and I know I can always count on two individuals to grill, my uncle and my dad. I won't overwhelm you with pictures of my food. Just know that their brisket, BBQ baked beans, pasta salad, grilled sausages, and hamburgers were on point, as always. Given this point, it only made sense to create a great outfit or two for the celebration. But the #colorsofflags challenge, hosted by runningnstyle, judithdeesworld, vintageontap, and akramsideas, inspired this patriotic make. My 4th of July outfit was created using Mimigstyle's Man's Shirt to Woman's Top tutorial and S1283. I love the fact that this crop top was made using an old dress shirt (Hooray to up cycling! 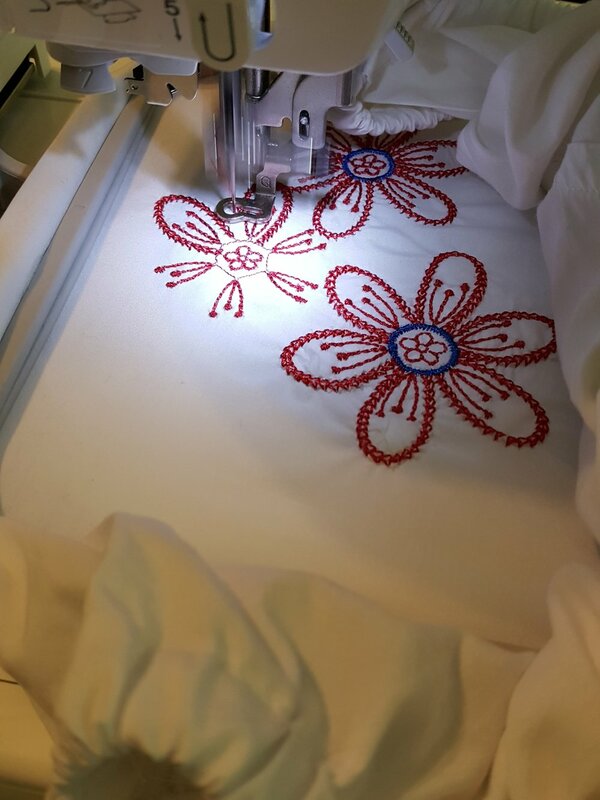 ), and I made the top unique by embroidering a few flowers on the front of the shirt. I recently did a post that contains a link to my review on Simplicity 1283 View C, which can be viewed here. I picked up an amazing navy blue ponte knit from my local JoAnn to make my pants this go round. As for JJ's dress, I didn't intend to make anything for JJ for the 4th, but as I was digging through my stash of fabric it dawned on me that some of my fabric scraps would look great as a dress for her. The red chevron print pieces were actually cut out of two fat quarters that have been sitting in my fat quarter basket for a while now. McCall's M6912 has been sitting in my pattern stash for a couple of months now and I knew it would be perfect for this project. I love the fact that the dress is reversible. I also added a simplicity appliqué patch as a special touch. My niece is known for dropping food on her clothes during grub time (since she insist on feeding herself), so any dress that can simply be reversed after a spill is great! The pattern review for McCall's M6912 is below. Infants' pullover, back mock wrap, reversible Top and Dresses; Bloomers and Pants with trim and pocket options. NB-XL. I cut a size medium for my niece. The bloomers are ready to wear (store bought). Yes, for the most part. The instructions regarding finishing the straps was a bit confusing. I think that particular section could use better illustrations. I love that this pattern is reversible, I also think that it is a great scrap buster pattern. I always have pieces of fabric leftover from my projects that aren't large enough for me to use on another project. However, these pieces were perfect for this pattern. 100% Cotton for the most part, the contrast side (geometric print), however, is a light weight polyester knit that I found on sale at my local Walmart. No alterations but I did omit the pockets and added a simplicity appliqué patch. Yes, I will be making a few more of these for my niece before the summer ends. I know I will have plenty of scrap fabric for it.